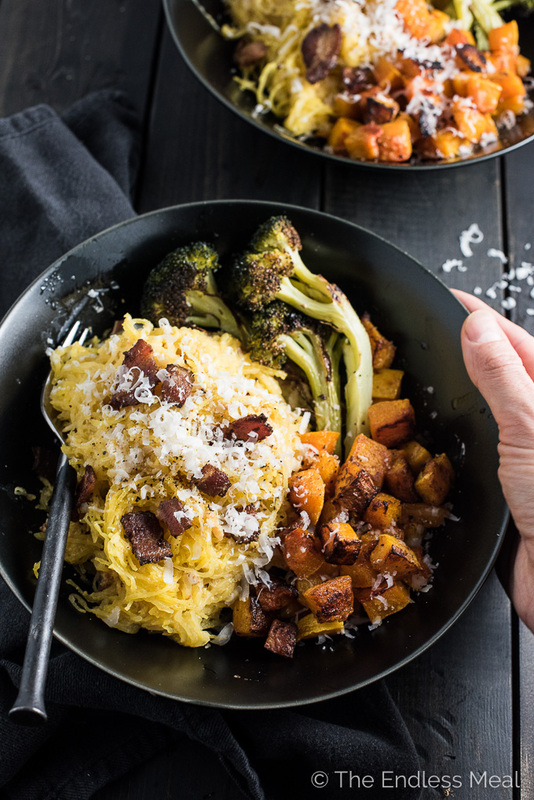 Spaghetti Squash Carbonara is everything deliciously carby dreams are made of, without any of the carbs. It's almost too good to be true. 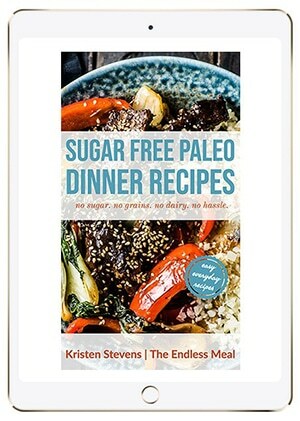 Paleo + Whole30 compliant. If sitting down to a heaping plate of vegetables disguised as carbs is your kind of thing, then you are in the right place, my friend. Also, can we be besties? Veggies parading around as bad for you food is THE BEST! We have so much in common. 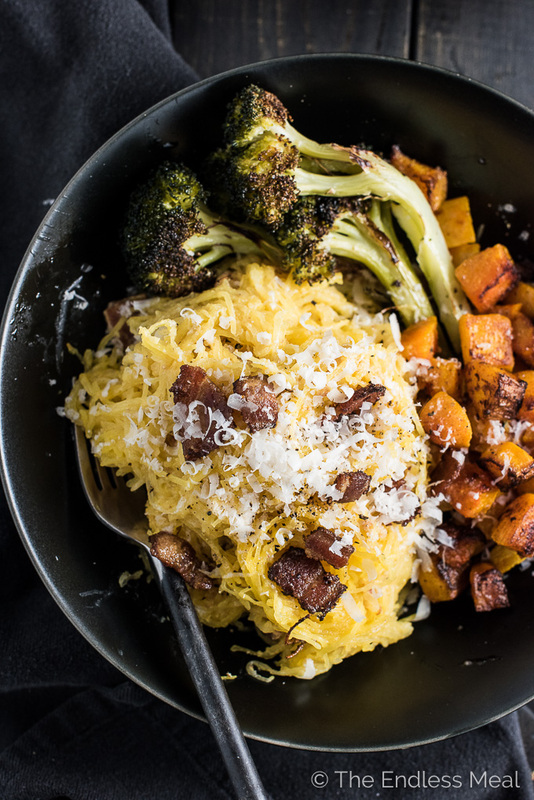 This spaghetti squash carbonara is every bit as rich and bad-for-your-body TASTING as the real thing with only the tiniest fraction of carbs. Oh ya, you'll also get your full daily dose of veggies. No need to pull out the stretchy jeans for this one! The sauce is made in a similar way as authentic carbonara with bacon, egg yolks, and parmesan so there is tons of flavor. All that is missing is about a bazillion carbs. ?? My handsome man and I can agree on most things. Yes, we should go to the beach this weekend. No, let's not clean the house. Another negroni? Always. Spontaneous road trip to the Grand Canyon? Obviously. ← That actually happened. Where we veer off and go our separate ways is with vegetables. He likes them. Heck, he should since he grew up a vegetarian. But he doesn't crush over vegetables in the rather embarrassing way that I do. When I asked him what he thought of spaghetti squash carbonara his response was, “It's good, but where're the noodles?” I was told that a man can't live off of vegetables alone. My cries that there are bacon, eggs, and cheese in here went unnoticed. 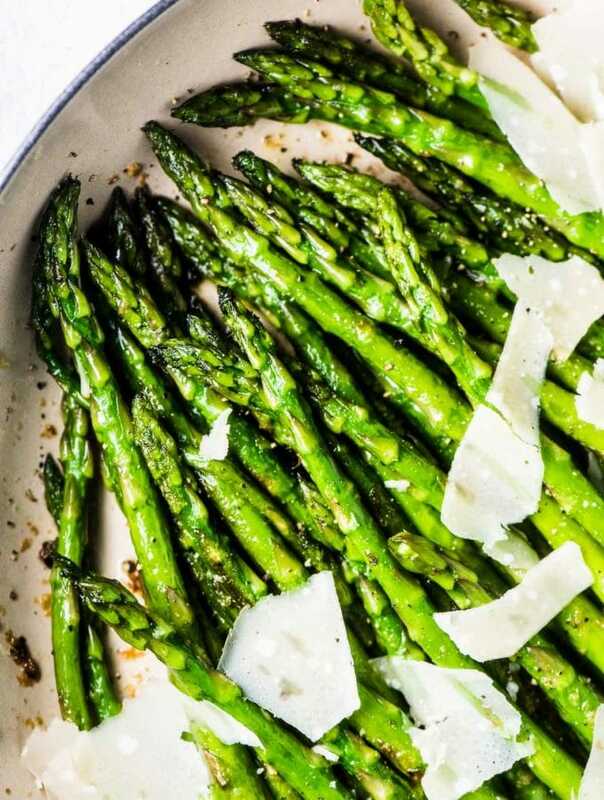 Moral of the story: if you're like me and love your veggies, this is a dreamy meal. 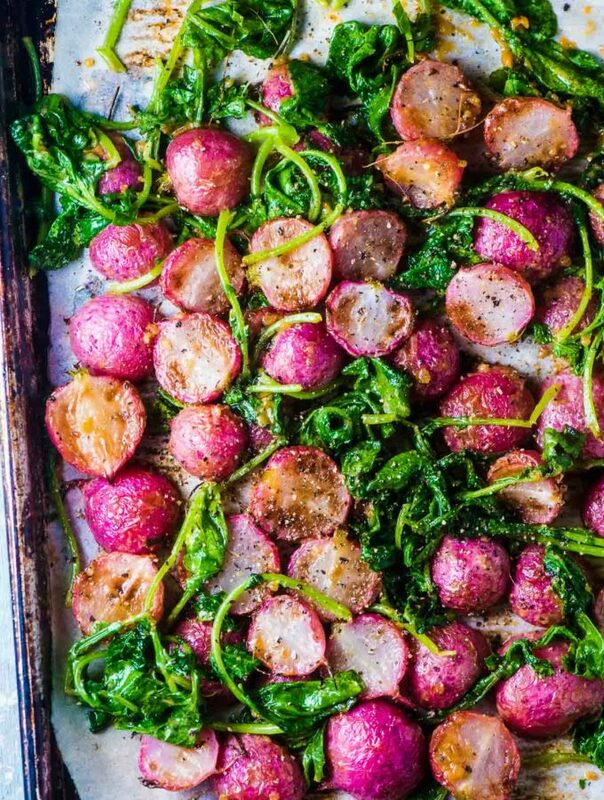 If you're more on Team Veggies are OK then you might want to serve this as a side. It scores 100% in the wintery rich department. There's so much flavor going on here, even though there are only a few ingredients. It's a little like magic. Bacon. Do I need to say anything else? If you're serving this as a main, there are only 2 pieces of bacon per serving but those little pieces give the dish SO MUCH flavor. There's no cream. None. Zip. Zero. The truth is, authentic carbonara sauce never has cream in it, but so many of the recipes you'll find if you ask Google have cream. It's not necessary at all. It's easy to make. 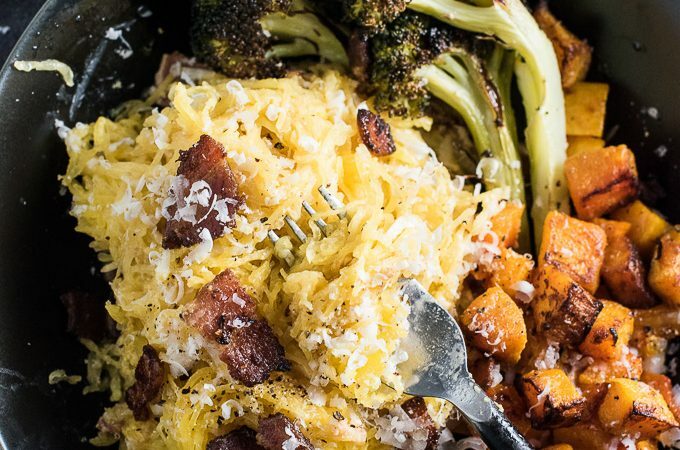 Pop the spaghetti squash in the oven, cook some bacon, add some stock and egg yolks to the pan and whisk whisk whisk, then grate a little parmesan and dinner is served. Veggies. Lots of good for you veggies. 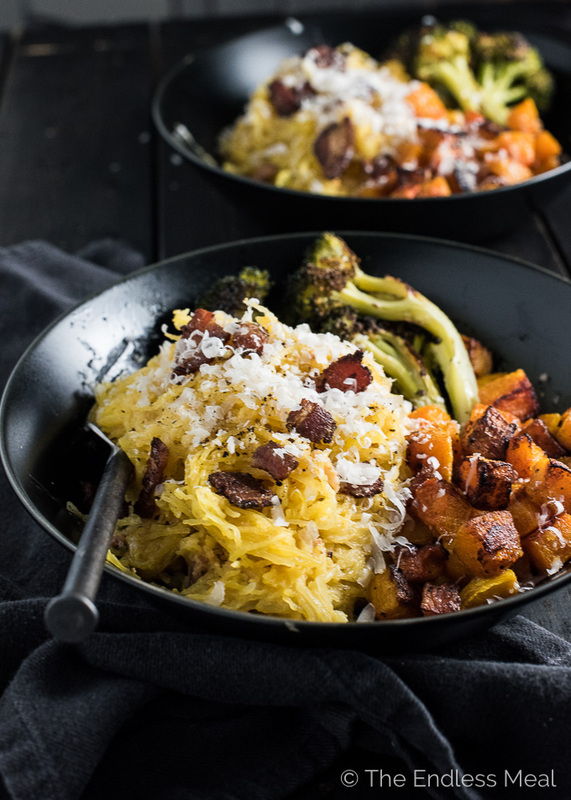 I've made this spaghetti squash a little differently that you would if you used regular pasta. Normally, you add the egg yolks to the hot pasta so they cook and create a creamy sauce. Because the spaghetti squash is more delicate than regular pasta, it can't handle being tossed around much. To get around this, you're going to add some stock and egg yolks to the pan you used to cook the bacon. As the stock heats up, the egg yolks will thicken it and create the sauce. It's a little like making bacon hollandaise. 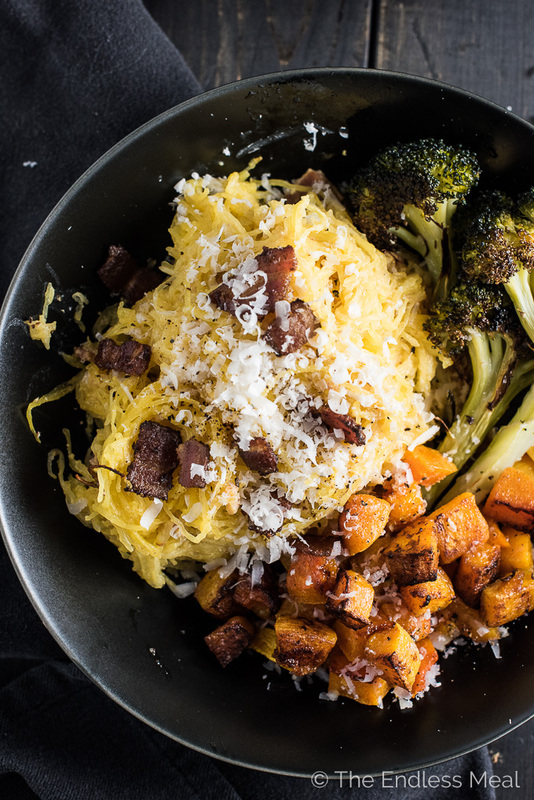 If you make this Spaghetti Squash Carbonara with Winter Squash and Broccoli make sure you snap a pic and tag #theendlessmeal on Instagram so I can like and comment on your photos. I love seeing TEM recipes you create! 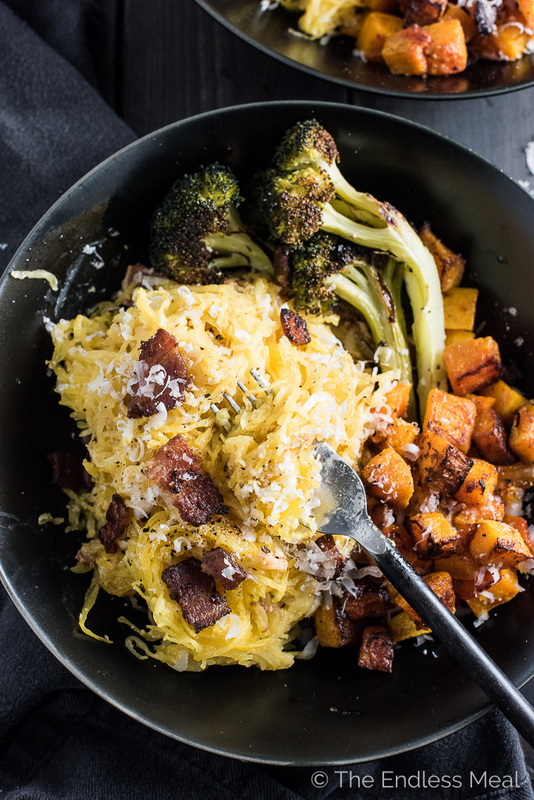 Spaghetti Squash Carbonara is everything deliciously carby dreams are made of, without any of the carbs. It's almost too good to be true. Turn your oven to 425 degrees. Line 2 baking sheet with parchment paper. Cut the spaghetti squashes in half and remove the seeds. Drizzle a little olive oil into the middle and place them cut side down on the parchment paper on one baking sheet. Place the butternut squash cubes on the second baking sheet, drizzle with olive oil and sprinkle with a pinch of sea salt and cayenne pepper then mix with your hands. Place both baking sheets in your oven. After 20 minutes, flip the butternut squash cubes and push them to one side of the tray. Add the broccoli and drizzle with a little olive oil. Bake for a further 20 minutes. Remove both baking sheets from the oven and carefully flip the spaghetti squash over. Holding onto one spaghetti squash at a time with a clean tea towel, scrape the strands into a large bowl. While the squashes are baking, prepare the carbonara sauce. Cook the bacon in a large frying pan over medium-high heat until crispy. Remove the bacon from the pan and pour off all but a teaspoon of the bacon grease. Add the chicken stock to the pan and scrape the bottom of the pan to remove any of the stuck on bits. Turn the heat to medium-low. Add the egg yolks to the pan and whisk constantly until the sauce thickens, about 3-4 minutes. Whisk in the parmesan cheese then remove the pan from the heat. Add the bacon to the bowl with the spaghetti squash strands then pour over the carbonara sauce and carefully toss to coat. Serve with the butternut squash and broccoli on the side. Hi Kristen! This looked amazing and I decided to try this out yesterday. I had a question about step 5, where you mix a teaspoon of bacon grease, cup of chicken stock, and 2 egg yolks – could you share what the intended consistency is? I don’t have previous experience with carbonara aka I didn’t know what to expect haha. I was confused by the “whisk consistently until sauce thickens” part. My sauce never really thickened, it stayed pretty liquid-y. The end result was pretty good but just wanted to ask for future reference. Thank you! And I can’t wait to try some of your other recipes! So happy to hear you like the recipes here!! OMG! Kristen, you are a genius! I LOVE carbonara, but never have it because it is such heart attack on a plate, never mind about the thighs….. I can’t believe I never thought of it, but I’m so glad you did! Thank you bella! Awww thank you so much! I totally feel the same way about carbonara. It was so nice to eat it guilt free!